Simply stated, rhythm is time, or when something happens. That sounds easy enough, but what is time? To the ancient Greeks, rhythmos meant motion measured. Again, that sounds simple enough, but it’s a little more complex than it appears to our ears – especially since it is time that is both moving and being measured! Time is the period or interval between two events during which something happens. In other words, time is a duration, a length which can be measured. To oversimplify, time is when and for how long something happens. As you will see, time may be irregular and unpredictable like Mother Nature, or regular and predictable like Father Time. To Mother Nature, a cycle is a recurring series of changes or events that do not have a precise measurement. The Greeks called it Kyklos, a cycle, or circle. Kyklos was thought to be a recurring period of time within which a defined number of events was completed. In nature, there are many Mother Nature cycles, here are a few: the Earth traveling around the Sun in about 365 days, the Summer Season lasting about 90 days, the Moon orbiting the Earth in about 28 days. As we can see, these natural cycles of Mother Nature are irregular and imprecise and do not occur at exactly the same time within the cycle. In other words, they have an unpredictable pulse. Pulse means to beat or strike, like the beating of our heart. Again, this beating may be irregular, uneven and unpredictable like the dripping of water from the roof of a cave, or the tides of the ocean, or, they may be regular, even and predictable like the tick-tock of Father Time’s clock. Let’s explore further into the clock’s predictability. To Father Time, a clock is an instrument of technology for the measurement of time by the steady and even motion of its parts. And whether this motion is the shadow of a stick in the ground tracking the movement of the Sun, or a cuckoo clock, or an atomic clock — the function of each is the same — to know the Now, so as to be able to predict the future! Here’s an interesting example, a complete Cycle of the Sun spans a period of 28 years, at the end of which, the days of the month will fall upon the same days of the week. In other words, April 15, 2011 will not again fall upon Friday until April 15, 2039! Meet you there… Now, let’s continue. Meter means to measure. And in music, we measure time by steadily counting the meter and then grouping these counted beats into even 2 beat, or odd 3 beat bars. These even or odd units of musical measure are symbolized by the meter, which is the top number of the time signature. The meter indicates how many beats to measure and group. 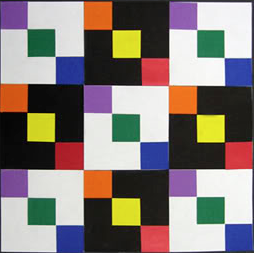 Remember, even and odd beats can be combined, multiplied or divided to create a virtually endless number of rhythmic patterns, known by such names as: shuffle, tango, disco, ska, bossa nova, swing, reggae, trance, mambo, techno, rumba, house, acid, dub… you get the idea. In the language of music, tempo is the number of steady beats counted in one minute. Said a different way, tempo is the rate of speed of the steady beat. For example, the standard household clock ticks one beat per second, in other words, it only has one tempo setting: 60 beats per minute (bpm). Therefore, a clock’s musical application is very limited. However, a metronome, which is a clock with a variable tempo setting, has virtually unlimited musical applications. It’s interesting to note that in ancient Greece, Metron (metro) meant to measure and Nomos (nome) was a form of musical composition. Let’s concluded this lesson by applying what we have learned about rhythm to two simple songs: Twinkle, Twinkle Little Star, and Pop Goes the Weasel. Twinkle, Twinkle Little Star is in meter 2, and this two beat meter is counted: 1, 2, 1, 2, and so on. The two beat meter is known as a March rhythm. In contrast, Pop Goes the Weasel is in meter 3, and this three beat meter is counted: 1, 2, 3, 1, 2, 3, and so on. The three beat meter is known as a Waltz rhythm. Be sure to stay tuned and learn how the simple meters of March 2 and Waltz 3, lead us to two very different genres of music and rhythm: Rock and Blues. ‘Til next time, stay in time and on time, no matter what rhythm ~ I’ll be listening . . .
Are you spending a lot of time and effort practicing and yet never seem to make any progress? Then maybe you need to re-think what practice is and what you can do to make it more productive. To the ancient Greeks, practice was definied as: do. Today, the definition of practice is: repeated action to acquire proficiency. You’ve heard the old saying, practice makes perfect, well, this is not entirely true! Repetition alone will not make you perfect. You must practice perfection, or else you run the risk of repeating previous mistakes… and what good are perfect mistakes? It’s been said that it takes seven repetitions for a memory to take hold and thirty five repetitions to erase that previously learned memory. Therefore, the concept of perfect practice becomes a necessity, otherwise you’ll end-up spending all your practice time trying to unlearn mistakes – with no time remaining to make progress! This unnecessary waste of time results in frustration, disappointment and lack of confidence. In other words, you feel like quitting. So, to help you avoid this and many other negatives – remember: Prior Planning Prevents Poor Performance. Some say that the goal of practice is the performance. I tend to think of it this way: practice is for yourself and performance is for others. However, I would agree that practice is the learning of the individual parts and that performance is putting the parts together holistically so as to play them as a whole from the beginning to the end. In other words, practice is digital (start and stop) while performance is analog (continuous). Whatever your performance goals are, daily practice is essential for the goal to be reached. By setting aside a short amount of time, at the same time each day, you will start to develop the process of practicing and begin to create good practice habits that will last a lifetime. It’s important to note that each practice session is made up of many sections. And when each section is followed routinely, your practice session will become more productive. This will lead you to a more successful performance. Although the responsibility to practice is yours alone, encouragement from a parent, spouse, friend, band member or teacher can certainly help you become more disciplined. So, be sure to share this article with them. Now, with that said, here are a few suggestions on how to structure your practice session to make your practice time more efficient and effective and your performances more successful too. Let’s begin with the practice area. It should be a relatively quiet place with good lighting and a comfortable armless chair. It should also be free of interruptions from the computer, phone, fax, pager, tablet, TV and a host of other distractions that can break your concentration. In addition to your instrument, here are some other items that you will find useful: a music stand, metronome, drum machine or sequencer, tuner, CD, recorder, pencils, eraser and your music books. The idea is to have everything close at hand, so that you won’t have to stop practicing to go get something. Next, begin to prepare mentally by focusing on what you want to achieve in this particular practice session. If you have the time, think about what you would like to accomplish this week, this month, or perhaps even this year. The more defined your goals, the easier it is to attain them. To prepare physically, begin by relaxing and releasing any tensions from your body. This promotes correct body alignment and will help to avoid any future health problems such as carpal tunnel and tendinitis. Don’t forget, prevention is the best cure! Okay, now we’re ready to begin the actual practice session. First tune-up your instrument, and yes, make sure the piano is in tune! Start by warming-up with technical exercises. These will include various scales, arpeggios, chords, etudes and other finger pattern exercises and studies. When you feel that you are sufficiently warmed-up, proceed to the next step of the practice session. At this stage of the practice session, time is provided for a re-view of previously learned material. The definition of the prefix “re” is: again, therefore, rehearsal could be thought of as “re-hear-all” or, to hear it all again. This review of previously acquired skills creates a connection with the new material being learned. Other topics that may present themselves for review at this time are: rhythm, melody, harmony, sight-reading, analysis, tone production, and dynamics. Daily practice gives you the ability to proceed to the new material with confidence and optimism. That’s a very good thing! The next stage of the practice session is the actual learning of new material. This is when you thoroughly examine the new material to learn as much as you can before you play it. Some of the things you might encounter at this time are: key signatures, time signatures, tempo, fingerings, phrasing, and lots of other direction signs from the composer. After carefully considering all these elements, you are ready to begin practicing, starting at the beginning and proceeding slowly and perfectly until you reach the end. You will find it beneficial to break a whole song into smaller sections (even bar by bar) and then link those sections together. This will enable you to minimize, and hopefully eliminate, mistakes at this stage of the practice session. Sometimes the fastest way is to go slow: think of the tortoise and the hare! A perfect practice is only possible if you begin slowly. Slow enough to think before you play. Another benefit of going slow is that you can break the habit of stopping and repeating from the beginning whenever you make a mistake. This in itself is a mistake! Instead, you learn to isolate and focus on a mistake as it occurs, then re-think it through as many times as necessary to get it correct before moving on. This is much better than wasting time repeating what you already know. It also helps if you can record your practice so that you can objectively hear what you really played. This will help you identify any problem areas, correct them quickly and improve your future performances. And finally, a progressive practice guarantees that each practice session builds upon the last and that each sequential practice assures your continued ability to confidently proceed from perfect practice to successful perfect performance. Do you want to be a successful musician? Of course you do! Then it would be beneficial to learn all you can about how to effectively and efficiently approach the development of your musicianship. Don’t worry if you feel as if you don’t exhibit these Top 10 behaviors already, the good news is, you can begin to cultivate them now. And best of all, as you acquire these ways of being, you will become more effective, efficient and successful in other aspects of your life as well. If you surf the internet for advice on how to become the musician you’ve always wanted to be, you will most likely become overloaded with endless suggestions. So, for now, let’s just focus on the Top 10 behaviors that will guarantee your musical success. 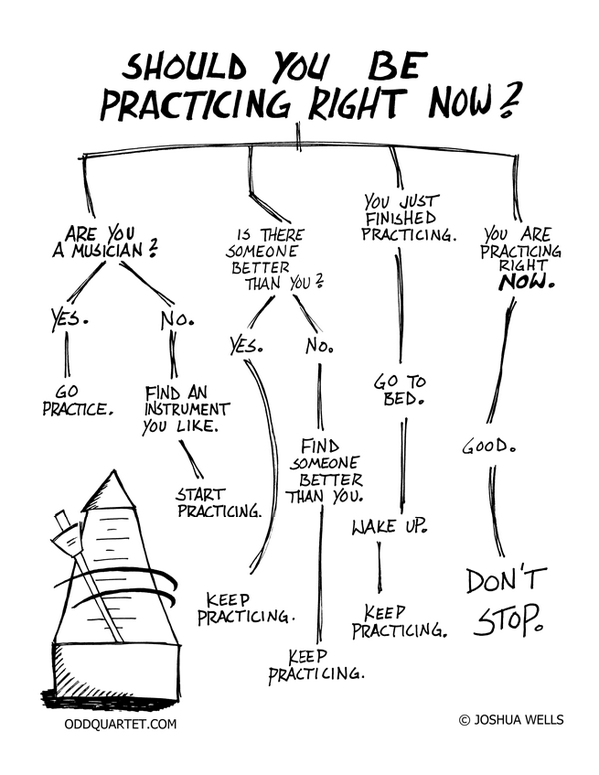 Successful musicians maintain a regular practice schedule and practice every day. Practicing is easier than most believe it to be. Just 15 minutes a day, everyday, will have you progressing steadily – little by little each day. The key to efficient and effective practicing is time management. In other words, successful musician creates the habit of practicing at the same time each day, every day. Some like to practice in the morning, while others like to practice at night. The time of day doesn’t matter as long as you practice daily. The important thing is to pick a time and do it. Remember, you can’t skip a couple of days and then practice for hours and hours to make up for the lost time – it doesn’t work that way. Slow and steady wins the race. Successful musicians are curious and ask many questions to get the answers they need in order to progress. They are interested in what other musicians are doing and are happy to learn from them. Start by looking for different ways to approach your practice. Seeking new systems and methods of learning is always healthy and beneficial. Remember, contrary to the old cliche, curiosity did not kill the cat – she just played better! Successful musicians don’t practice without thinking about what they’re practicing. They stay focused to avoid distraction and diversion. Successful musicians practice with attention to detail to ensure their success. So, be sure to think through your problems to find ideas that will solve them. Try out several approaches until you find the one that leads you to success. By staying on course you will discover what works and what doesn’t. If you’re new to playing music, you will more than likely face a steep learning curve. But don’t let that stop you, learning and practicing gets easier after you’ve been playing awhile. And no matter how long you have been playing, there is always something new to discover that will keep you inspired and challenged. Successful musicians know where they’re going. They have a plan and stick to it. They realize that prioritization is the key to the success of any endeavor. Successful musicians put things in order and choose what etudes and songs to practice at the beginning. This makes it easy to follow through to the end. Successful musicians work on their plan daily, weekly, monthly and yearly so that they may reach their goals based upon importance rather than urgency. It’s important to periodically evaluate whether your efforts are propelling you toward the achievement of your goals. If they are not, then clarification of your goals and the means needed to achieve them will be necessary. Plan your practice and practice your plan. Successful musicians take the initiative and are proactive self-starters. This is the primary determining factor for their effectiveness in music and life. Being proactive rather than reactive will quickly lead you to success. If you like the idea of playing an instrument, and perhaps even impressing people with your skills, then you will need to manage yourself. Successful musicians know that through self mastery many wonderful things may be accomplished. Remember, no one will fire you if you don’t show up to practice, and no one will remind you of the deadlines you’ve set for yourself. To paraphrase Smokey The Bear, only you can make yourself a successful musician! Perhaps it is your goal to be in a band or orchestra and play harmoniously with other musicians. If so, it’s important for you to value and respect others, as this will lead to the best long-term relationships. Genuinely striving for mutually beneficial solutions and agreements will guarantee success for all. Win-win relationships are much better than having only one person get their way. When everyone feels included and involved in an environment of trust and loyalty, everyone succeeds. Successful Musicians understand that listening to another first and then having them listen to you is the fastest way to create an atmosphere of caring, respect, and positive conflict resolution. This skill of empathetic listening cultivates an environment where misunderstandings can be avoided to facilitate harmonious music making with others. Synergy, or combining the strengths of many people into one positive team, will make possible the achievement of goals that no one person could do alone. Successful musicians know that creating the most prolific performance by a group of people is best achieved by encouraging meaningful, inspirational and supportive leadership by all. It is essential to understand that everyone is a master of something – but not of everything. Be the one who takes the positive approach with other musicians in your group, then everyone’s potential will come together for the best result. Successful musicians understand that success doesn’t happen overnight. If you persist in working toward your vision you will eventually realize it, even if there are a few rough patches along the way. Know that constant improvement of one’s self, along with the development of one’s skills, is necessary in order to achieve success. By balancing and renewing your resources, energy, and health you will experience effective musicianship throughout your life and become the successful musician you have always wanted to be. Okay, now ask yourself which behavior is the most important for you to become a successful musician. It might be one of the Top 10 above, or, you may believe that it’s something else. I, and the others who are reading this post, would like to know what you think, so, please leave a comment… thank you. Let’s imagine we are playing guitar 10,000 years ago. One starry, starry night, while sitting around the fire in our cave after a long, hard day of hunting, we begin fooling around with our bow. An accidental pluck of the string makes a pleasant musical tone. This is good. Then, another accident occurs, we push on the bow, and like a whammy bar, the string gets looser and the tone gets lower. At that moment, relative pitch is discovered. Things seem to be developing nicely until we begin having difficulty playing at faster tempos. Then comes the thought to reach over and pick up our favorite arrowhead, and like magic, the plectrum, also known as the pick, is born. Now, let’s fast forward to the 21st Century and look at the development of the modern pick. Although picks may be of any shape, they generally take the heart-like shape of an isosceles triangle with two very rounded corners, and a third corner, the point, rounded to a lesser degree. Regardless of the shape, the picks edge will be smooth and rounded, or sharp and beveled. The classic pick shape of today, the 351, was created by Luigi D’Andrea in 1922. It was the first pick made of celluloid, and with the imprint and endorsement of Nick Lucas, it became the most popular pick of the 1930’s. Picks vary in thickness to accommodate different playing styles and gauges of strings. Manufacturers usually print the thickness on the pick in millimeters. The following is a thickness guideline: Extra thin/light less than 0.38, Thin/light 0.51-0.60, Medium 0.73-0.81, Thick/heavy 0.88-1.20 and Extra Thick/heavy more than 1.50. Thinner picks are flexible and do not deliver a forceful attack. They do not play very loudly and tend to make a clicking sound when the string is struck. Thin picks do not respond well when fast alternating down and up strokes are required. Also, they tend to rip and tear when used forcefully or with heavy gauge strings. In contrast, thicker picks produce very strong attacks and are capable of both quiet and loud dynamics. Thicker picks are less likely to wear down over time and they offer more control with heavier gauge strings. Jazz guitar players, who favor heavy gauge flat-wound strings, often use small tear-drop shaped medium picks of various materials. In a pinch, just about anything will function as a pick: a coin, button, popsicle stick, credit card, paper clip, ice cream wooden spoon — even a baseball card. Over the years, picks have been made out of just about every material imaginable: bone, shell, tortoise-shell, wood, amber, stone, gemstone, coconut, ivory and metals: steel, brass, nickel, silver, gold and platinum. Metal picks produce a very bright sound and tend to wear out the strings quickly. Metal picks can easily damage the finish on the guitar if used for strumming, especially acoustic guitars. Billy Gibbons of ZZ Top uses a Mexican Peso filed down to the classic 351 shape. Today, the most common of all modern pick materials is plastic. Plastic ranges from the easiest to bend, nylon, to the hardest to bend, ultem. It’s interesting to note that a pick of the same thickness will be fairly flexible if made out of nylon and very stiff if made out of ultem. Thickness and material go hand-in-hand. It should be mentioned that plastic is very slippery and many non-slip devises and friction coatings such as: wire loops, rubber, cork and holes were incorporated into pick design from the very beginning to provide traction to keep the pick from twisting and flying out of sweaty fingers. As Aerosmith said, get a grip! Now, let’s examine some of these plastics. Celluloid, discovered in 1870, was the first commercial plastic and the most popular pick material of all. More picks were made from celluloid than all other materials combined. By the turn of the century, the celluloid pick had begun to replace the warm and comfortable tortoise-shell pick. And by the 1940’s, picks of modern plastics were out selling celluloid picks. Amazingly, D’Andrea continued to make tortoise-shell picks until 1973 when the Endangered Species Act halted production. Fender didn’t stop making celluloid picks until 1993. Nylon is more slippery than celluloid and most manufacturers add a high-friction coating to make them easier to grip and less likely to twist and fly out of the players fingers. Nylon is extremely flexible and most thin and extra-thin picks are made from it. Nylon picks tend to lose their flexibility and become fragile and break after extensive use, so, guitarists should have several spare picks in the case, just in case. Delrin by DuPont, also called Acetal or Tortex, is smooth, glossy and slick. It is very hard and stiff and wears down slowly. Lexan has a shiny, glass-like and extremely hard surface that wears down relatively fast. Ultem is a space age plastic that has the highest hardness and stiffness of all plastic picks. Ultem produces a very bright (treble) tone. Tortis is made from polymerized animal protein, and comes very close to the sound and feel of natural tortoise shell picks. Tortis picks are usually thick with smooth beveled edges. Dweezil Zappa endorses a tortis pick. 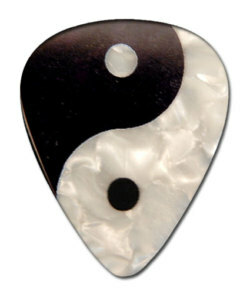 Agate guitar picks are harder than metal andcannot be flexed regardless of their thickness. Since no press or injection mold is needed to make an agate pick, they may be individually crafted to meet the players specifications. Lignum Vitae is a rare wood that is harder than ebony. Its cellular structure contains natural oils that give this pick its unique feel and sound. Glass picks are generally hand blown and range from round points with natural edges to sharp points with beveled edges. The pick is usually played with the pointed end and gripped with two fingers: thumb and index. However, many players use different grips. Eddie Van Halen holds the pick between his thumb and middle finger, while James Hetfield and Steve Morse hold the pick using three fingers: thumb, middle and index. Pat Metheny also holds the pick with three fingers, but plays using the rounded edge of the pick. George Lynch also plays with the rounded edge and so did Stevie Ray Vaughan. George Benson and Pat Martino hold the pick very tightly between the thumb and index finger and attack with the surface of the pick nearly parallel to the string for a very articulate and consistent tone. Circle picking is a technique where the thumb is bent on the downstroke and straightened on the upstroke, causing the tip of the pick to move in a circular pattern. This tends to produce a lighter articulation. The angle of the pick in relation to the string can create a broad range of effects. For example, moving the pick edge along the length of a round wound string at 90╝ produces the pick scrape. In closing, here’s a tip my classical guitar teacher taught me to keep my fingernails smooth and slick. I discovered it works on picks too. Lightly sand the point edges of your pick with 600 grit sandpaper until a smooth, slick surface that slips effortlessly over the string is achieved. Do this when the edges get rough from playing, and since new picks tend to have rough edges, be sure to sand your pick before you use it the first time. One final thought, my pick of choice is a Dulop Delrin 500 Series, 2.0 mm. ‘Til next time, no matter what pick you use, get to the point and have some plectrum fun. I’ll be listening! You are currently browsing the 12tonemusic blog archives for June, 2014.